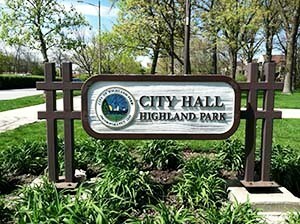 The Highland Park Plan and Design Commission will tackle two final housing development plans and a wireless telecommunications facility proposal at its regular meeting today at 7:30 p.m at City Hall, 1707 St. Johns Avenue. Scheduled business on tonight’s agenda includes a review for two design-alteration applications: a partial demolition of the former Fuddruckers Restaurant building at 1538 Clavey Road and exterior modifications to 615 Roger Williams Ave. for Ravinia Brewing. The commission will consider a final development plan for two proposed buildings: McGovern House, a 73-unit complex and one-lot re-subdivision at 760-776 Central Avenue and 1710-1724 McGovern Street; and “Heritage," a 12-unit complex and one-lot re-subdivision at 1005 –1055 County Line Road. Additionally, the commission will hold a public hearing on an application for special use of new wireless telecommunications infrastructure on an existing monopole antenna and on through new appurtenant ground-mounted equipment installed into an existing enclosure at 210 Skokie Valley Road. The commission also is expected to announce that the next meeting will take place on Jan. 19.